After the housing bubble burst in 2008 we saw several years of declining home prices before home prices finally reached bottom in late 2011 and early 2012. Due to the tremendous growth in foreclosure activity, as well as artificially inflated home prices as a result of sub-prime lending, many of St Louis’ lowest priced neighborhoods were hit the hardest. So, now that we have seen a solid real estate market in St Louis for a couple of years, and prices are recovering, how have home prices in these hard hit zips recovered? 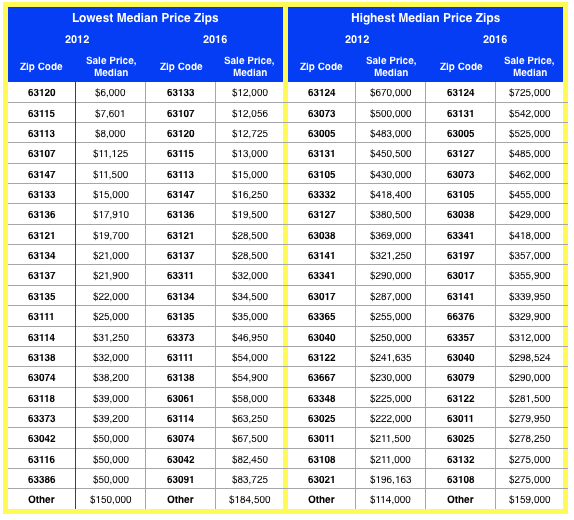 To determine this I have assembled the data on the first table below, showing the zip codes with the lowest median home prices during the first half of 2012 and then the zip codes with the lowest median home prices during the fist half of 2016. As you can see, while there were a few differences in 2016, the zip codes on the list are largely the same. The crash also impacted the high price zips too….how have they done since? Certainly the highest priced areas of St Louis were impacted as well by the crash, but, in most cases, not as bad percentage-wise as the lower priced zips. To examine this, as well as how the prices in these higher-priced neighborhoods have done since, I also assembled the data for the St Louis zip codes with the highest median prices during the first half of 2012 as well as 2016. Once again, most of the zips on the 2012 list remain on the 2016. Low priced list zip, 63118, has seen home prices increase nearly 250% since the crash and high-priced zip, 63341, over 40%! In the second table below, I ranked the zips from both the low priced zip code list as well as the high priced zip code list to show those zips where home prices have recovered the most since the bottom. On the low priced list, 5 zips have seen home prices increase by double digits, 3 of which are located in the city of St Louis and 2 in St Louis county. 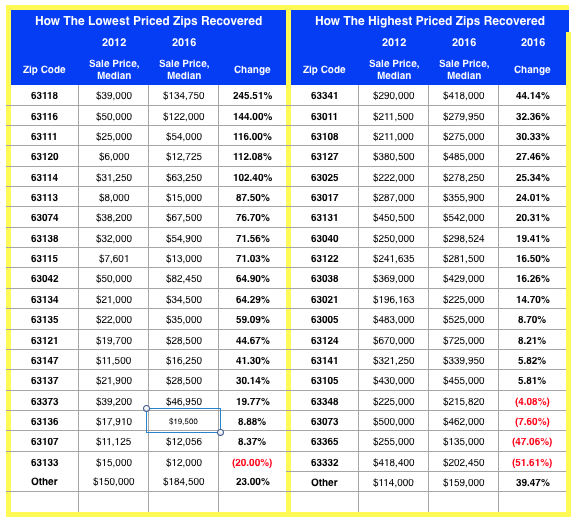 On the high-priced zip list, the highest recovery was in 63341, the Defiance area of St Charles County, then of the next 4 highest increases in prices, 3 zips are in St Louis County and 1 in the City of St Lous.